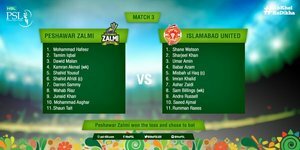 #PSLT20 , Peshawar Zalmi vs Islamabad United, 3rd Match: Peshawar Zalmi won the toss and elected to bat. Wish u very best of luck @PeshawarZalmi for your 1st thriller ???? Keep ur head high we will be the winners???? @PeshawarZalmi opted to bat first. The first attack of tonight. This is The Real Crowd For Cricket . Vote for foodpanda #ZALMI by ordering @MAROTandoors Nutella & Pizza Naan! ???? Peshawar Zalmi won the toss and bat first. What would he bring into party tonight?